Words to Inspire a Spooktacular Halloween is Part V in the series of Words to Inspire. Halloween is traditionally celebrated on the eve of All Hallows Day, 31 October, commemorating the Saints, Martyrs and dearly departed. Nowadays, though it has become commercialised and is celebrated with party activities, such a trick or treat, dress-up, carving pumpkins into Jack-O-Lanterns, telling spooky stories, etc. 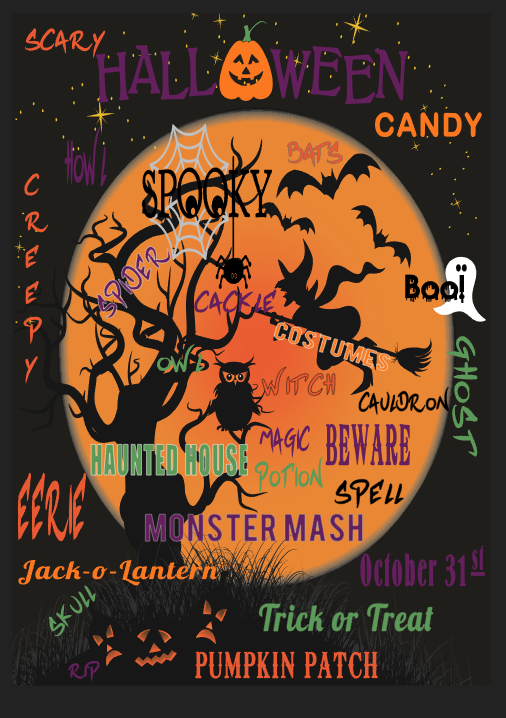 use the words to inspire your own Halloween craft creations. This Poster is available in PDF and is FREE to download and print, here. You are welcome to share it, however you may not sell it. 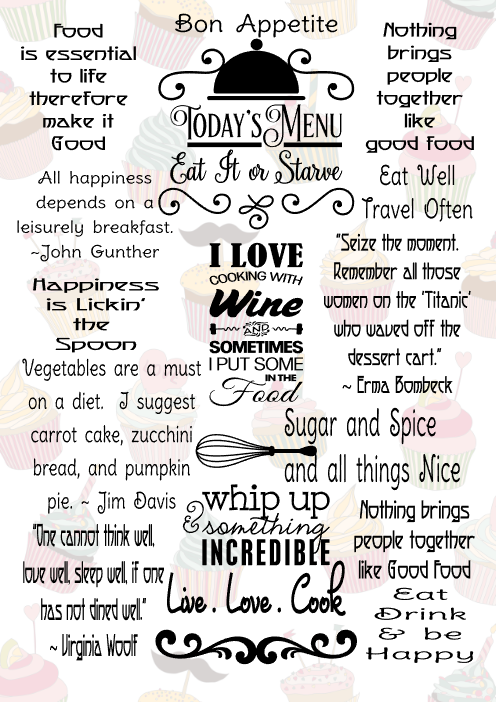 We are Cooking up a Storm in Part IV in the Series of Words to Inspire Craft Creations. Tempt your sweet tooth as we whip up some sugar and spice and all things nice in Grandma's Kitchen, the heart of our home. Don't forget to take the cake out of the oven as you pour a glass of red, red wine and set the table with our best China, long-stemmed crystal glasses, dinner candles and bouquet of flowers, as we set the mood for fine dining, the Master Chef way. This will not be a slap-up meal, oh No! We will use a dash of this and a splash of that; secret blend of herbs and spices; parsley, sage, rosemary and thyme, using only the best ingredients to enhance the flavours. Are you ready to experience Love at first bite? Be seated as Dinner is Ready! Bon appetite! In celebration of World Teachers' Day on the 5th of October, I have created Part III in the Series of Words to Inspire Craft Creations. World Teachers' Day was proclaimed by UNESCO on the 5th of October 1994 and is celebrated around the world, however, some countries do celebrate this special day on other days throughout the year. 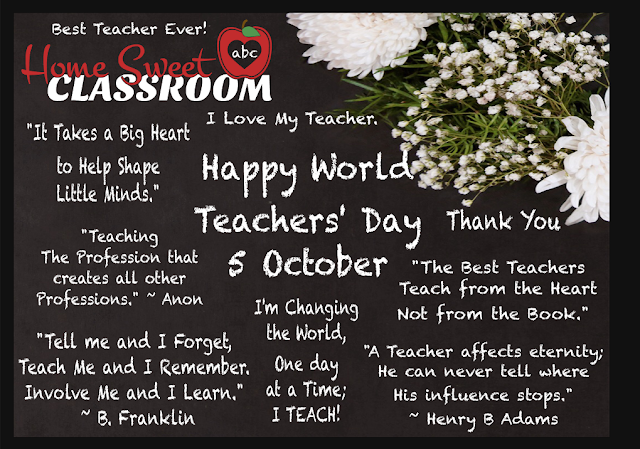 World Teachers' Day was created to show appreciation to all Teachers for their contribution in the important role they play in the development of our children. "It Takes a Big Heart to Help Shape Little Minds." I'm Changing the World, One Day at a Time; I TEACH! The Best Teachers Teach from the Heart, not from the Book." PS> Keep a look out for my Newsletter, The Art of Creativity Studio Club! Subscriptions will be available soon. Gain access to free resources, discount codes, new product releases and so much more.